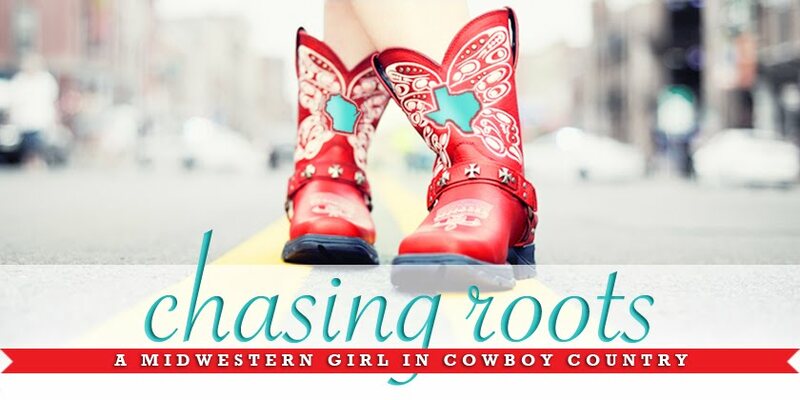 Chasing Roots: Are You Ready For Some Tailgating? 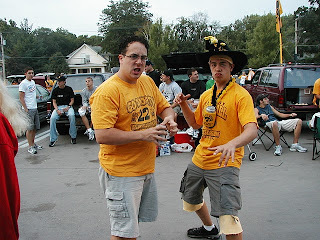 Back in the day, Tom and I were pretty serious tailgaters. As undergraduates at the University of Iowa, before rules and regulations designed to take absolutely all of the fun out of tailgating and to seriously cut down on who is actually ALLOWED to tailgate took effect, we partied like it was 1999. On Saturday mornings we’d rise by 4:30am and kick off the day with a power shower. (Power shower = showering while drinking a beer. The closest I get to a power shower these days is showering while my cup of coffee cools on the vanity.) At 5am we were in line to enter the tailgating lot, and when the parking attendants finally moved the barricades at 6am, we were beyond ready to get the party started. 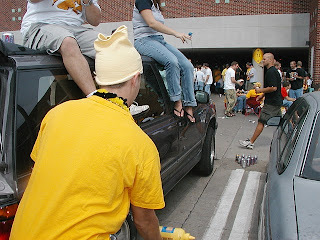 Our tailgates included mustard bowling and drinking games I can’t remember the names of (gee, I wonder why); donut holes for breakfast, chips and salsa as a mid-morning snack, and grilled hamburgers and hotdogs for lunch; and plenty of cheap beer. 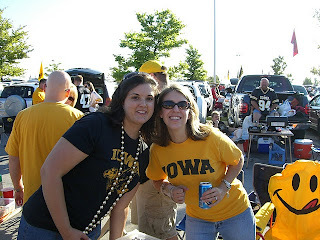 Tailgating attire included Hawkeye underwear, man-pris (Tom’s pretty sure he invented these home-made Capri pants for men), capes, wigs, overalls, knee socks, jewelry, etc. The crazier the ensemble, the better. 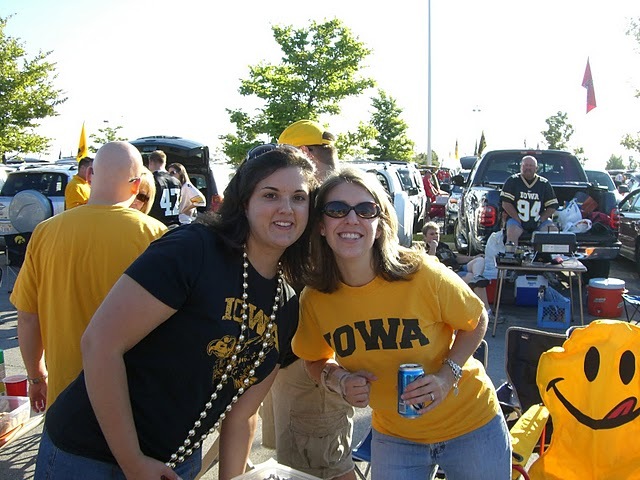 Undergraduate tailgating at the UI was authentic, and because we had very little money, it was primarily about spending time with friends and celebrating the Hawkeyes with a little, err, a lot, of beer on the side. on the left. They're enthusiastic. 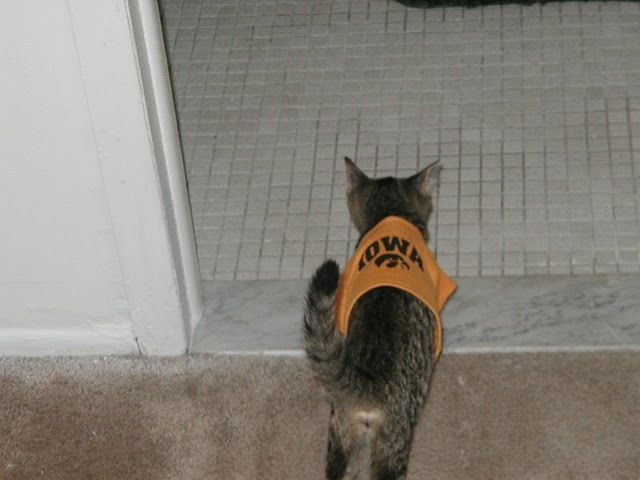 Even our pets love the Hawkeyes. Hawkeye tailgate at Soldier Field in Chicago. Kristin, taking her turn drinking out of the challis. 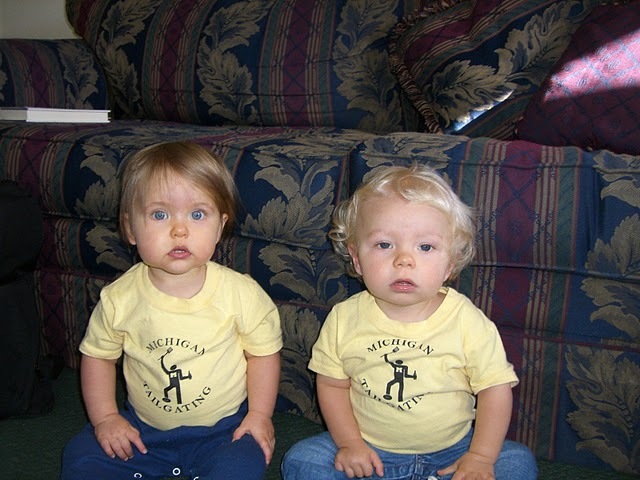 After our years at the UI we moved to Ann Arbor, Michigan, home of the University of Michigan Wolverines. Our tailgating crew at UM was made up primarily of first-year graduate students, most of whom had tailgated seriously at their undergraduate schools. 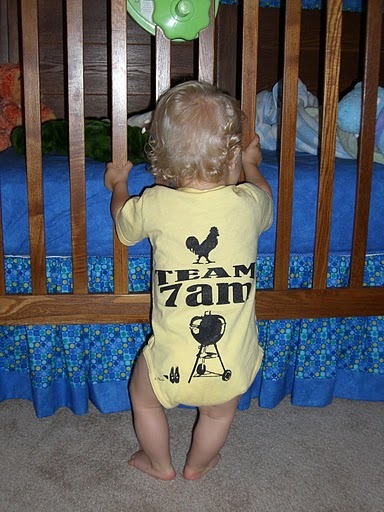 During that first fall we formed “Team 7am” – we even designed a logo and made t-shirts. We felt a little guilty about starting the tailgating process at 7am (at UI we’d have been tailgating for at least an hour by that time), but because the lots opened at 7am we didn’t really have much of a choice. And the extra hour of sleep was nice. 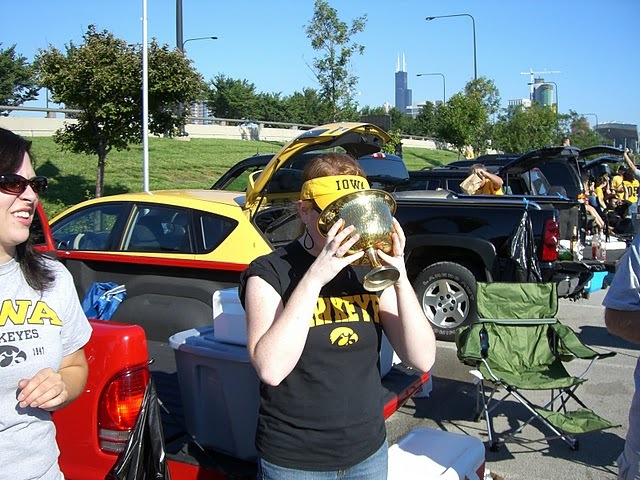 Tailgating at UM was more “high-society” than at UI. I remember watching a UM tailgater open up the back of his tricked-out Expedition to reveal TWO flat screen television sets and a full bar. Made mustard bowling look a little pedestrian. To keep up with the Joneses, Team 7am stepped up the pace with more elaborate games (beer pong and bean bag toss), an expanded menu (eggs and bacon for breakfast, brats and chicken wings for lunch), and higher quality beer. When we realized we, as aging tailgaters, needed to coffee get going in the morning, we’d spike the pot with a little Kahlua. ...the next they shaved their heads. 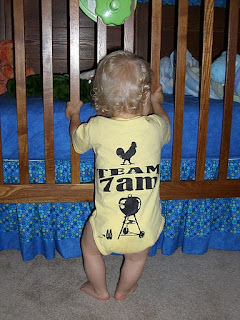 Team 7am also had a few onesies made. Will looks like he's been tailgating just a little too hard. Will always felt right at home on Katrina, Arleigh, and Megan's deck. We started teaching Will how to expertly grill chicken wings early on. Mama's bottle and Hallie's bottle. Every week we'd bring the 'Stein to our tailgates. Afforded us hours of baby-free-hands. Even today the sounds of televised football lull Hallie to sleep. Justin, Hallie, and Will, on one of Hallie's not-so-cheerful days. Perhaps protesting a Hawkeyes' loss? Tom and I have also tailgated at the University of Wisconsin in Madison, where tailgating is a combination of what we experienced at UI and UM. Crazy Hawkeyes + Extravagant Wolverines = Wisconsin Badger tailgaters. I would have loved that kind of excitement as a college student, but now, as a parent who will someday drop her children off at one of these universities, my jury’s still out. When we moved to College Station we were told by natives and transplants alike that Aggie tailgating is a big deal. 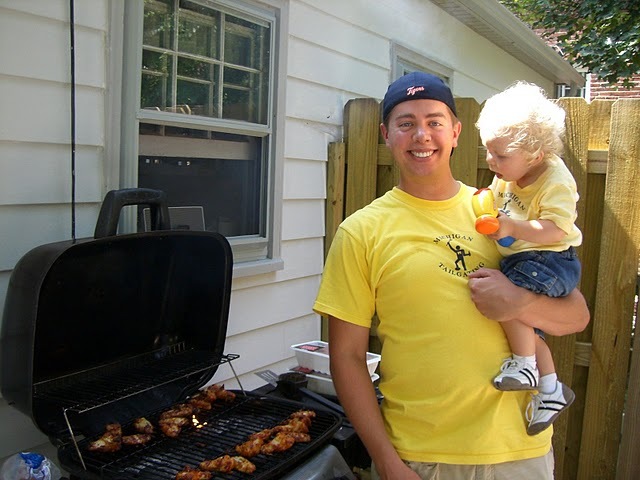 We’d nod our heads and smile, knowing that we – experienced tailgaters – would judge for ourselves come football season. 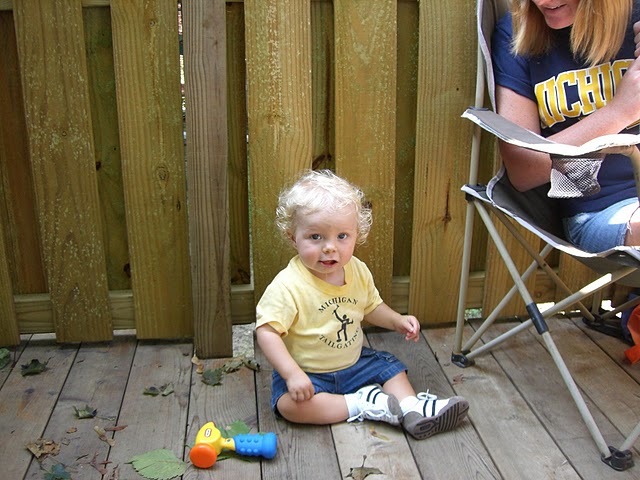 On the first game day we headed down to campus, threw Hallie in the stroller, and started walking. The saying “everything is bigger in Texas” absolutely applies to individual tailgates. Wherein we might have had only the space behind one vehicle to spread out in at UI or UM, the tailgate plots for Aggie fans are huge. This makes sense though, because their grills? Their grills – the ones they transport to tailgates – are bigger than any I’ve ever seen. These clever Aggies have also come up with a big way to beat the heat on those 100+ degree September Saturdays. I saw great Aggie attire (Aggie dresses are really popular here), lots of tailgate games (but no mustard bowling), and delicious-looking food. The crowds were calmer and more respectful than we were used to, which I’m sure we – as adults with children in tow – appreciated more now than we would have 10 years ago. The next step for us is to actually find out how to score a tailgating lot/spot. 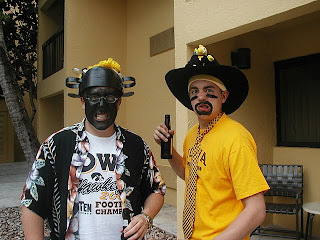 Once we’ve done that we'll invite our friends to a very unique tailgate – they should expect Aggie size, with a bit of Hawkeye crazy and Wolverine extravagance thrown in. In summary, I just wrote an incredibly long post about tailgating at four different schools just so I could post this picture of Aggie tailgaters and share with you that riding in the backs of pick-up trucks is totally legal here.